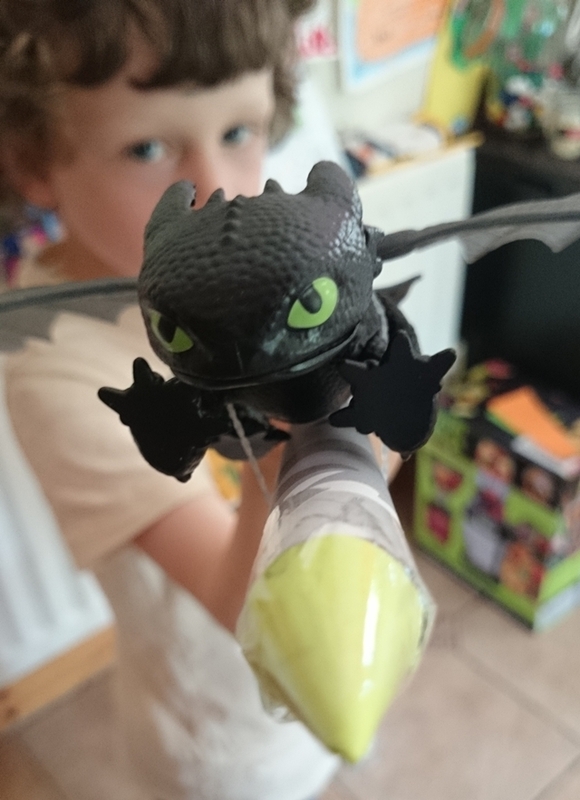 There is lots of excitement in the house today; and we are not talking about the start of the Summer holidays, we are talking about the arrival of the all new action packed series … Dream Works Dragons: Race to the Edge! … released on Netlfix, today, Friday 26th June. The popcorn is bought, the couch is booked and the whole family plan to start the holidays off in style tonight. And there will be the newest member of the family squeezing in too… this little guy. 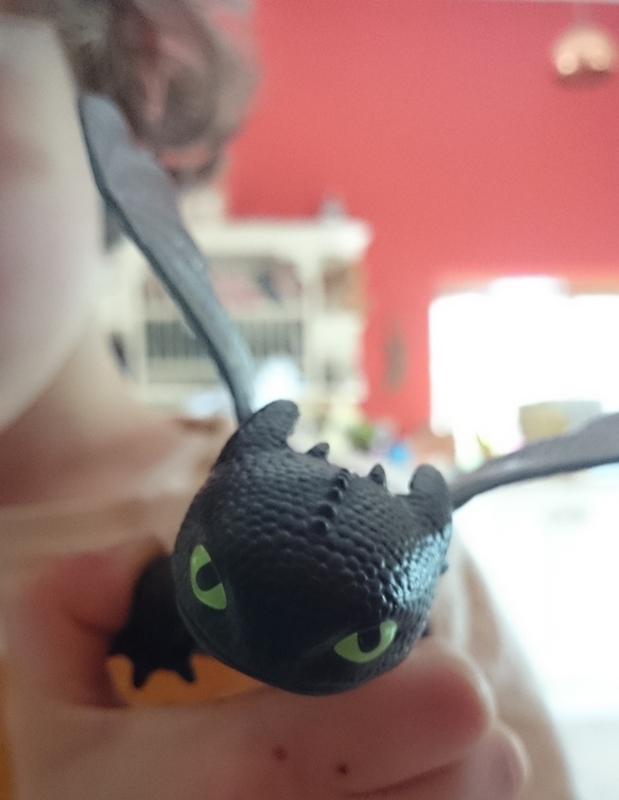 My youngest is a huge fan of toothless so imagine his excitement when a package arrived from Netlfix this week containing his all-time favourite dragon, along with his trusted side kick – Hiccup! My only worry is that dragon and small boy will be asleep before they even get to watch their favourite series – such is the level of action that the two adventurers have already clocked up. 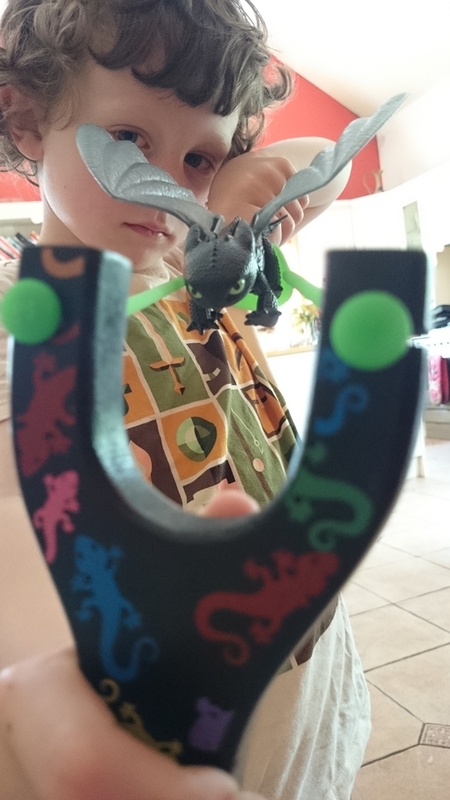 First off, toothless is a flying dragon, as we all know, so small boy enlisted a little help from science to get his friend airborne… Newton stated that every action has an equal and opposite reaction and that is what both boy and dragon counted on with this little stunt! Did it work? Well, it certainly got toothless flying right across the room but eventually the pair decided that they needed more height and distance and turned their attention to rocket power. They constructed a stomp rocket and the fearless dragon was taped to the rocket, secure and ready for launch. Test flights gave good results in the corridor until Mum decided that it was an experiment best brought outdoors. 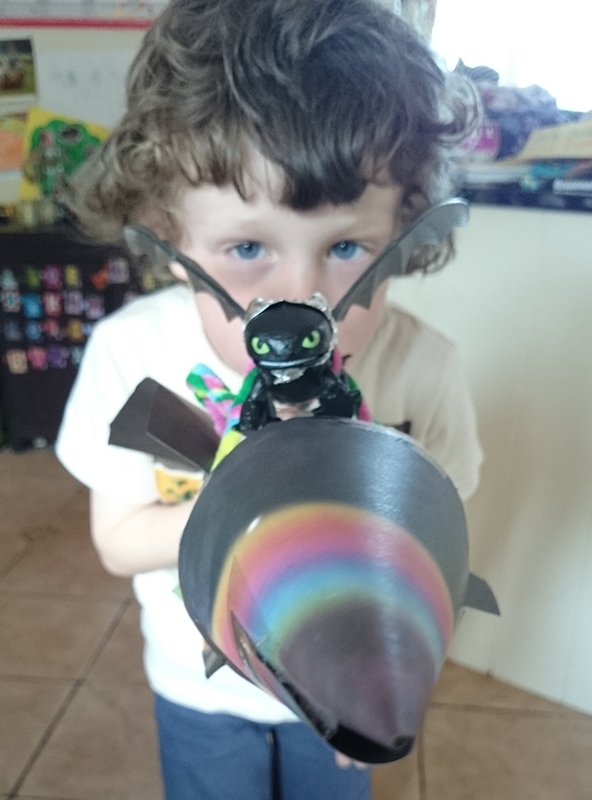 Boy and dragon were very happy with the flight distances that this little adventure achieved. Happy, but not completely sated, they decided that distance was good but they wanted a little more height… time to bring in the big guns and launch a bigger rocket. 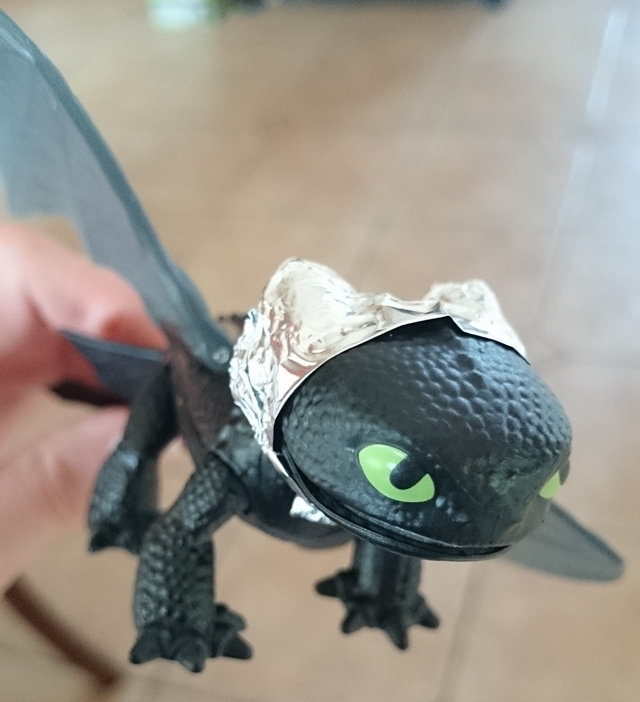 At this stage they were wisely persuaded that the fearless dragon should, at least, be wearing better safety gear… so they built him a helmet! Onwards and upwards, toothless was strapped in place and all set for launch. 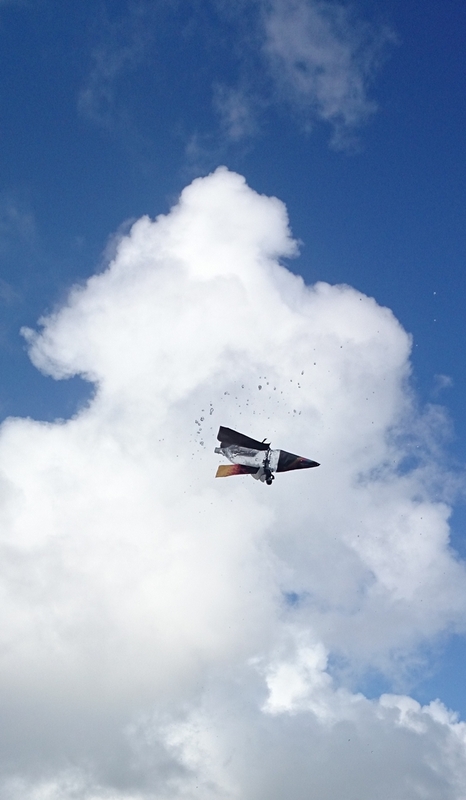 A successful flight, awesome heights, and a relatively soft landing (if you are made of hard plastic and wearing that, oh so important tinfoil helmet). Maybe they didn’t make it into the stratosphere but the dragon certainly earned his wings… and a good night’s sleep! What to do… tape one end of the rubber tubing to the neck of the bottle and tape the other end to one end of the PVC pipe. Next make the body of the rocket by wrapping a piece of paper around the PVC pipe and secure it with tape at the overlap. Remove the rocket from the pipe. Cut four triangles of paper and attach to the body of the rocket near one end; these are the rocket fins. Make a nose (cone shape) for the other end of the rocket and attach it with tape. You are now ready to launch your rocket. (Best to do this outside!). 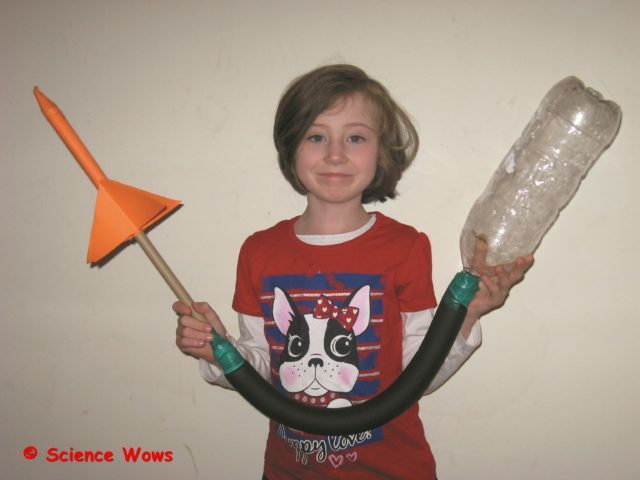 Sit your paper rocket over the PVC pipe and place the 2L bottle on the ground on its side. Stomp on the bottle and watch your rocket shoot off! What to do… using the paper make three fins and a nose cone for the bottle rocket, the base of the bottle is where you fit the cone, attach the fins around the side of the rocket. Push the ball pump needle through the cork until it comes out the other side; Fill the bottle rocket one third full with water and plug the neck of the bottle with the cork. Attach the food pump to the ball pump needle and, either hold the bottle rocket or secure it vertically on the ground (we used an adapted funnel). Start pumping until…. your rocket launches with a big whoosh of water and flies into the air! Disclosure: I received the toy as part of the Netflix Stream Team; All opinions expressed in this post are my own. A rocket can describe any object that is propelled by fast moving liquid or gas! Most rockets have a nose or cone at the top, a body that houses the fuel and fins at the base. 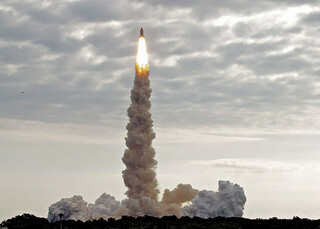 Rockets are usually powered by a chemical reaction (explosion) within the rocket itself. This chemical reaction requires both fuel and oxygen, both of which must be carried within the rocket. The fuel and oxygen are called the propellant. There are two types of propellant, liquid propellant and solid propellant. 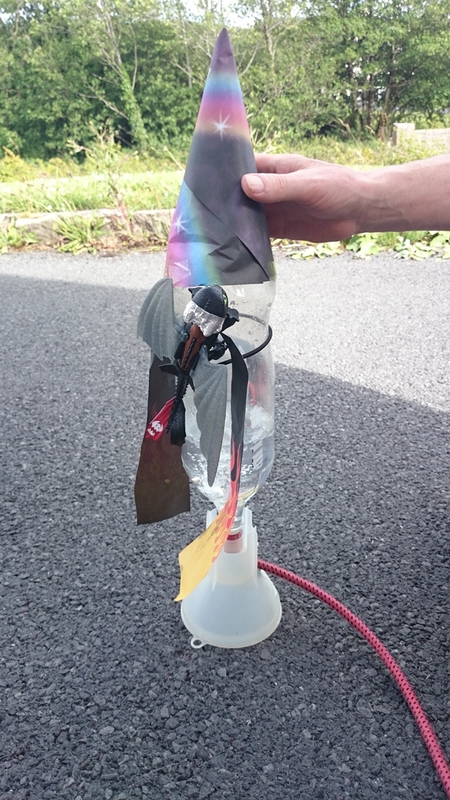 A solid propellant rocket is easier, simpler and cheaper to make. However, these rockets are harder to guide and control as once the chemical reaction is started it is hard to stop. A liquid propellant rocket is more complex and expensive to make but the burning of the liquid fuel is allot easier to control. The Chinese were the first to invent rockets when they started filling bamboo tubes with gunpowder and lighting them. Rocket science really began with an English man called Isaac Newton. He formulated three laws to explain the physics of motion. These laws explain how rockets work! Newton‛s 3rd Law of Motion states that every action has an equal and opposite reaction! To understand this law think of a balloon full of air. 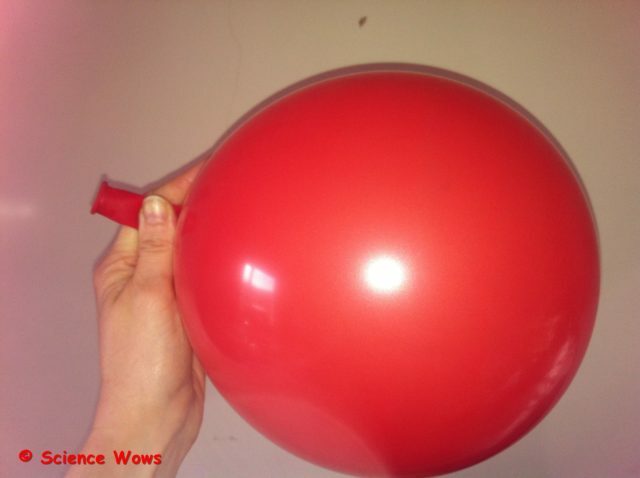 If the balloon is untied and the air suddenly let out, it will escape the balloon with such force that it will propel the balloon in the opposite direction. The force of the air leaving the balloon is called the thrust! The thrust that powers the launch of a rocket comes from the force of the gas (generated by the burning fuel) being ejected from the rear of the rocket! The first liquid propellant rocket was launched in 1926 by an American called Robert Goddard. He is considered the father of modern rocket science! 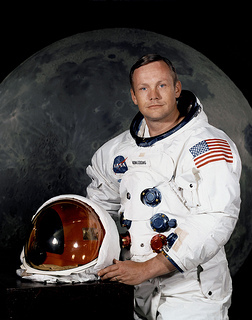 In 1969 Neil Armstrong and Edwin Aldrin became the first men on the moon. Armstrong and Aldrin traveled to the Moon in a rocket called Saturn V. It was 100 metres tall and weighed more than 3,000 tonnes! It was the largest rocket ever launched! So what is happening?… when you stomp on the bottle the air inside it shoots out through the tubing and the pipe, forcing the rocket off the end of the pipe! Just blow into the pipe to re-inflate to bottle to start again! If you try any of the experiments or have any comments or questions, please let me know in the comments below!